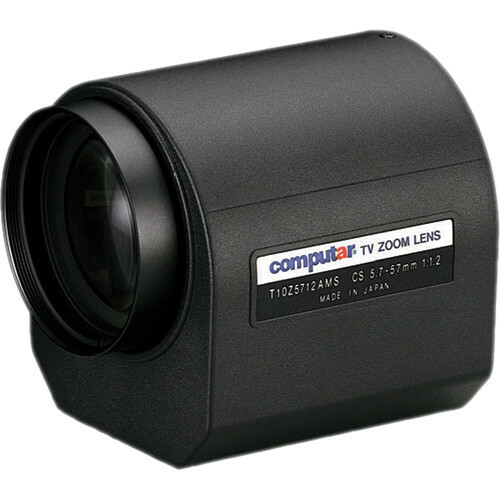 The computar T10Z5712AMS 1/3" f1.2 10x Motorized Zoom, Video Auto Iris Lens w/Spot (5.7-57mm) allows you to control focal length, iris and focus via a lens controller. It is suitable for applications requiring long distance surveillance such as parking lots and highways, where variable focal length and remote control are required. Box Dimensions (LxWxH) 5.3 x 4.1 x 4.0"
what type of connector does it have? This lens has a multi-wire connection. The lens will get screwed on via a CS mount and instead of an IRIS 4 wire control, there will be additional wires for zoom as well as IRIS control.